A spring garden is one of the sweetest things. 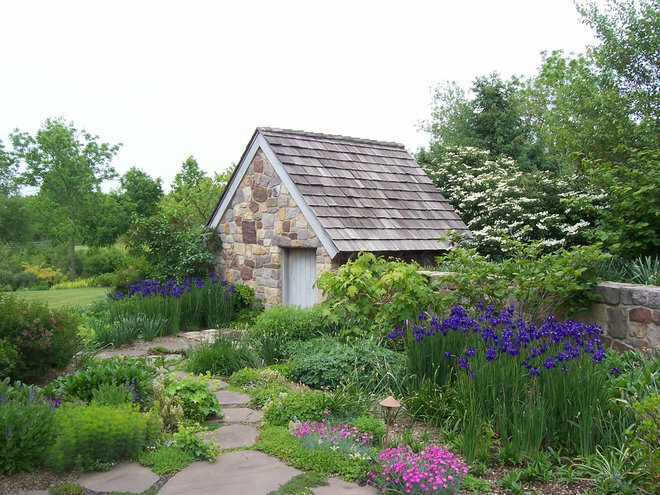 Bulbs emerge from the ground as if by magic, trees leaf out with fresh green growth, and flowering shrubs and perennials burst into bloom. 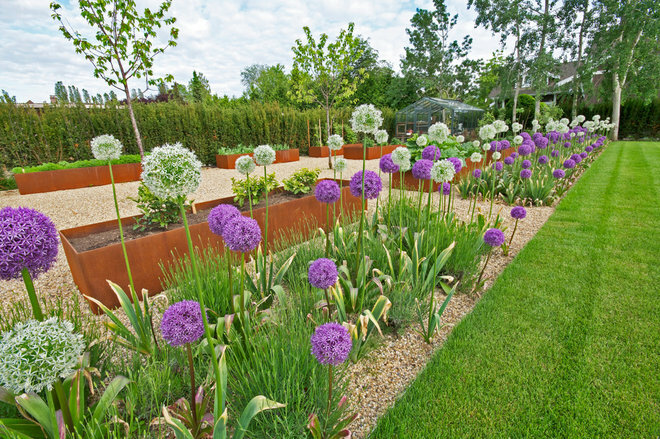 Here are 10 ideas to make your garden shine in the spring. 1. Showcase spring blooms. Bulbs such as tulips, daffodils and hyacinths, and delicate annuals like violas, primroses and nemesias steal the show this time of year, swathing garden beds in color. Perk up tired winter beds by picking up a few flats of annuals at the nursery and tucking them into bare spots. Make a note of where you’d like bulbs in your garden — perhaps lining a walkway or grouped in a patch by the mailbox — so you’ll have a plan in place when bulb-planting time rolls around next fall. 2. Plant in drifts. Plant drifts of flowers in a single color to get the most color impact in garden beds. Unlike a regimented row, a drift has a more irregular, natural shape — it’s how a single variety of wildflower would naturally grow on a hillside.Here, two drifts of ‘Caesar’s Brother’ Siberian Iris (Iris sibirica ‘Caesar’s Brother’) spread on either side of a steppingstone path form a dramatic swath of deep blue-purple. The Siberian iris has a clumping habit and will naturally spread to form a drift if planted in moist, slightly boggy soil. 3. Create a seasonal destination. 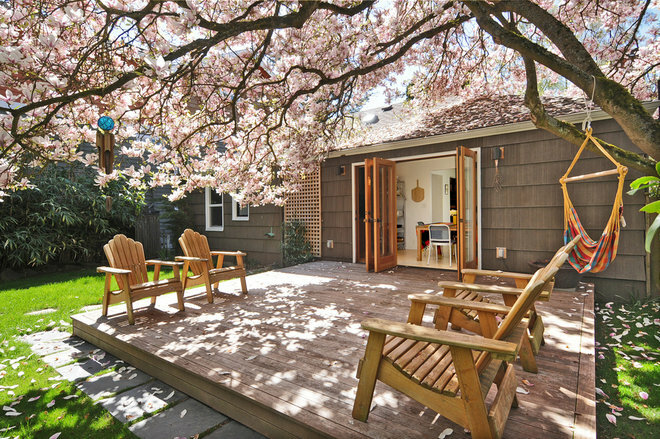 As you’re dusting off your patio furniture, consider pulling a pair of chairs to a spot that’s particularly beautiful — perhaps an area under a flowering tree or one with a view of the garden.Wherever you choose, make it a spot where you’ll be tempted to sit with a cup of morning coffee and enjoy the spring sunshine. 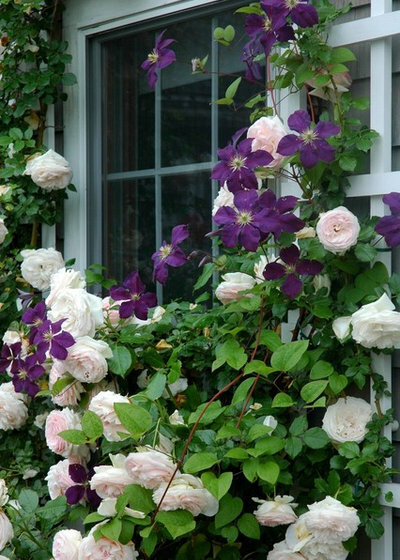 Plant climbing roses and allow them to ramble over a fence. Give your garden shed a fresh coat of paint and place a potted boxwood out front. Plant trailing herbs (like variegated thyme) and flowers (like marigolds ) to soften the corners of raised beds. 6. Plant clipped evergreens. While evergreens are easily appreciated in bare winter beds, they’re also surprisingly useful in spring gardens. 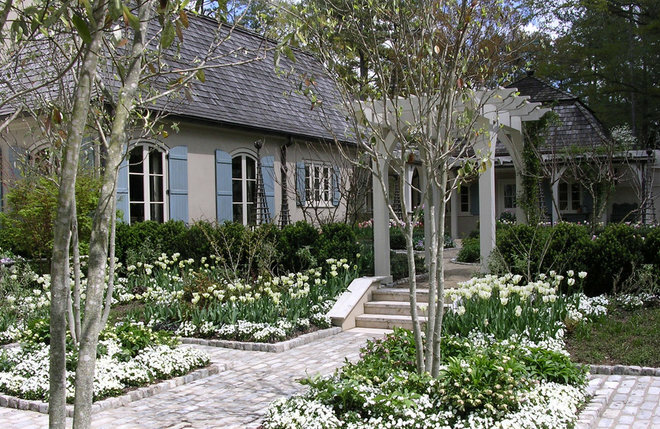 Use an evergreen hedge as a dark backdrop to show off pale blooms planted in front. 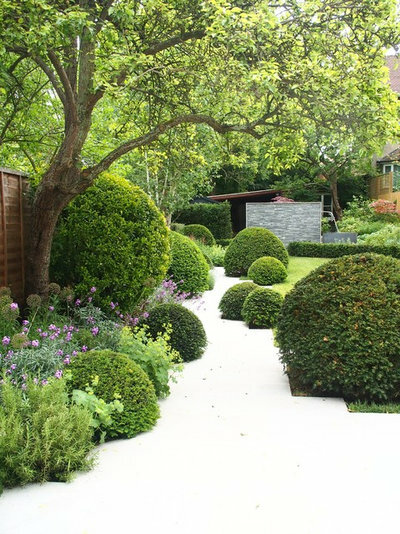 Clip a few evergreen shrubs into spheres or pyramids to add structure to beds and balance the loose forms of billowing spring flowers. 7. Add pollinator-friendly plants. While you’re planting perennial beds, consider including a few plants specifically chosen to support birds, bees, butterflies and other pollinators. Ideally, include a variety of nectar- and pollen-rich blooms in many colors (red, pink, bright violet, blue, yellow and orange) to support the widest range of pollinating birds and insects.Consider the peak bloom time of plants to ensure there’s a steady stream of sustenance. 8. Spruce up shaded areas. Shaded areas can easily turn into forgotten corners of the garden. 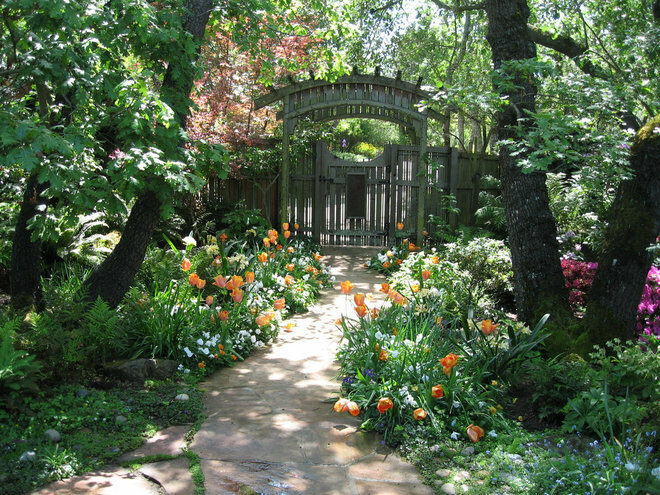 Instead, turn a dark area into a woodland destination that can be just as interesting and colorful as brighter areas. white pansies line the pathway amidst a woodland planting of flowering hellebores, blue forget-me-nots, lush ferns and pink azaleas. 9. Plant a sweet-smelling climber. 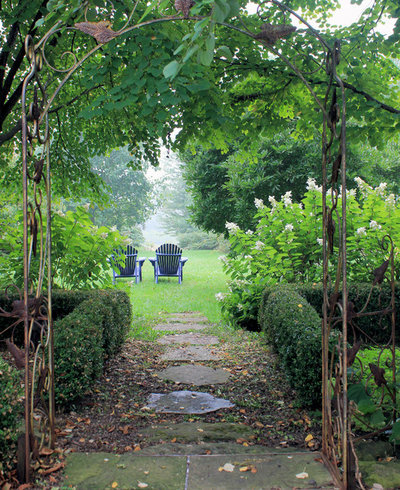 Add a romantic element to garden pathways and trellises with a fragrant vine or climbing shrub rose. 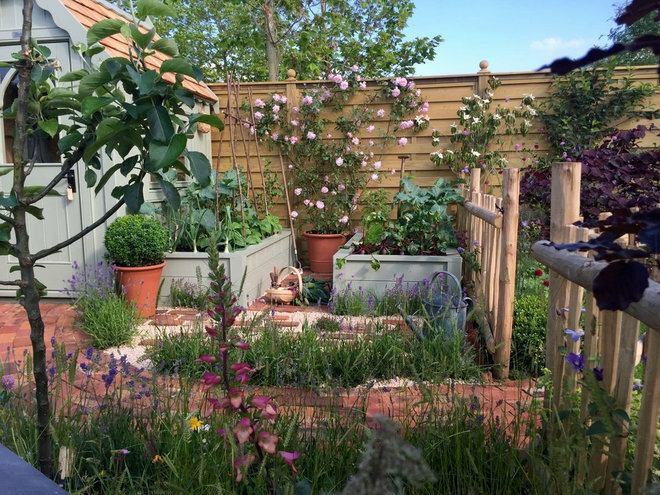 Plant near bedroom windows or along pathways leading to the home so that the fragrance will be carried on the breeze into sleeping and sitting areas. 10. Add a water element. 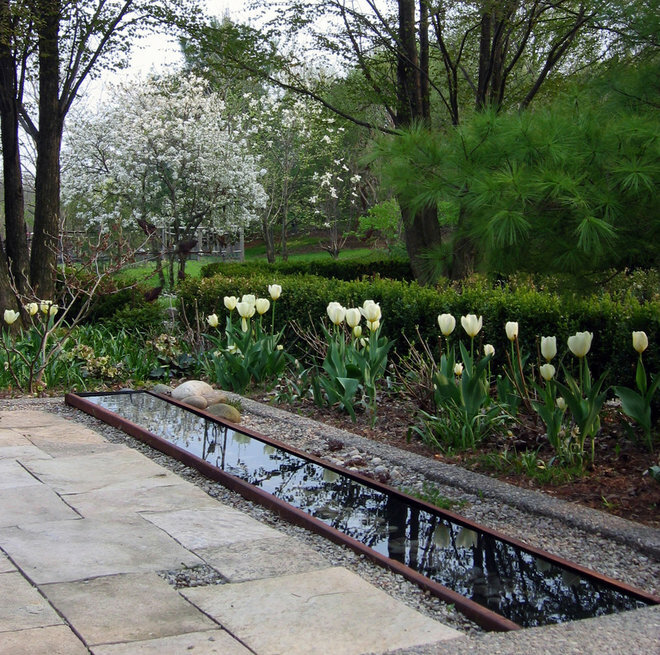 Water can be used in several ways to show off spring gardens and add interest to landscapes year-round. Trickling water in fountains and sloped water elements add movement and a pleasant sound. Still-water elements like pools and basins add a reflective quality and sense of depth.